Indian Head massage Uses a delightful blend of oils to nourish and stimulate the senses and a relaxing way to unwind. A great way to relieve headaches,tmj syndrome, sinusitis, colds,stress,depression and improve the conditioning of the hair. 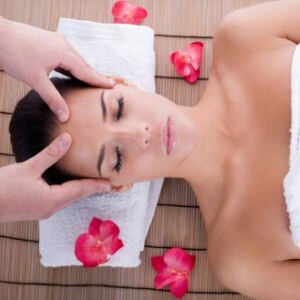 Indian head massage is usually performed sitting in a chair. The tops of the shoulders are treated down to the arms, neck area and head and face. Fibrous adhesions can be broken down (Knots). Stimulation and improvement of lymph circulation. Increased oxygen to the Brain, helping concentration. Relief from chronic neck and shoulder stiffness.